West Lulworth is a small village in the Purbeck district of Dorset and the majority of its dwellings are second homes. The village houses a school, general store, the Parish Church of the Holy Trinity and three pubs, the Castle Inn a 16th century thatched pub and hotel, Lulworth Cove Inn a pub and restaurant with B&B accommodation and Lulworth Beach House built near the site of the old mill is a B&B, Bistro and Cafe. The old mill was powered by water from a nearby spring and burnt down during the 19th century and the millpond is the only part that exists. West Lulworth is dominated by two hills, Bindon Hill to the east which is a 170m high ridge and has extensive remains of Iron Age earthworks and Hambury Tout to the west. The village is a gateway to the Jurassic Coast, the UK’s first natural UNESCO World Heritage Site and Area of Outstanding Beauty, which stretches 95 miles from Orcombe Point near Exmouth to Old Harry Rocks on the Isle of Purbeck, and the coastline provides a continuous sequence of Triassic, Jurassic and Cretaceous rock formations spanning 185 million years of the Earth’s history. The South West Coast Path is a 630 mile continuous footpath, the longest National Trail in the UK, along the coasts from Minehead in Somerset to Cornwall and Devon and ending at South Haven Point near Poole in Dorset. The views and the countryside along this fantastic trail attracts many artists, photographers, birdwatchers, botanists, geologists, historians, archaeologists and of course many walkers, tourists and sightseers. Lulworth Cove is a beautiful horse-shoe shaped bay only about half a mile from West Lulworth and was created by wave diffraction. The narrow entrance to the cove ensures that as waves enter they bend into an arced shape allowing the sea to hollow out the soft clays to reach the harder chalk behind. The Cove and nearby bays and beaches were used by smugglers from the late 17th century to the mid 19th century. Whether walking along the top of the cliffs, taking a boat trip, scallop diving, a swim in the sea or relaxing on the sandy beach down below in the cove there is something for everyone and the views are stunning. The steps at the eastern end of the beach lead to a walk along the cliff top to Fossil Forest and Mupe Bay but this land to the east is owned by the Ministry of Defence and used for shooting and tank training so is only open to the public at weekends and holidays. Please observe and obey the opening times, for more information call in at the Heritage Centre. Stair Hole, less than half a mile away, is a smaller cove and what Lulworth Cove would have looked like a few thousand years ago. The sea has made a gap and an arch in the Portland and Purbeck limestone and has begun to erode its way through to the Wealdon clays. The car park and the Heritage Centre can be seen from here which is part visitor centre, tourist information and natural history museum giving the history of Lulworth from 150 million years ago to the present day. There is also a cafe and ice cream parlour and areas to picnic or just to relax. Hambury Tout, a large and steep chalk hill of 138 metres high and the site of an ancient burial mound, stands high above this small bay and its steep scared footpath can clearly be seen starting from the back of the car park. The first bay on the other side of Hambury Tout is Man of War Bay it is a small bay where the Portland stone has not been entirely eroded away and at low tide the band of Portland stone is partially revealed. Immediately after Man of War Bay is the popular natural limestone arch of Durdle Door which is a beautiful world famous geological wonder and the most photographed landmark in Dorset. Durdle Door beach is an idyllic sloping beach for sunbathing or picnicking and is an ideal place for swimming or snorkelling from caves and exciting rock strata. The rock strata or layers are almost vertical and the bands of rock are quite narrow and nearly all the limestone in Durdle Bay has been eroded by the sea forming a small headland. Durdle Door can only be reached over Hambury Tout from Lulworth Cove or from Durdle Door Holiday Park where parking is available between 1st March and 31st August. We park in West Lulworth village at the side of the road near the church and walk slightly uphill and turn right along West Road. At the end of West Road we turn left and walk up the village then opposite the Castle Inn we turn right down School Lane. At the second footpath sign on the right next to a house and before we reach a post box on the left we turn right which takes us up some steps. At the top we turn right and follow the track through the trees and bear to the left, between some houses, to a t-junction. We now turn left uphill for a short way then turn right through a gate and follow the footpath sign for Lulworth Cove. We head forwards uphill through the field with the hedge on our right and the view opens up with Hambury Tout clearly on the right and West Lulworth down below on the left. When the path bears to the left by the topside of a wood and Lulworth Cove comes just into sight we turn right through a gate and follow the narrow path through the trees. Soon we come out into the open with Lulworth Cove in front of us turning right we head downhill and then uphill on the stepped path we can see in front of us, to the view point. We then head downhill to the car park and Heritage Centre passing Stair Hole on our left. From the car park we head up the obvious path of Hambury Tout which is a long steep climb with some steps. Once at the top we head downhill and down some steps to Man of War Bay down below. We keep heading forward on the South West Coast Path to reach the natural limestone arch of Durdle Door on the other side of Man of War Bay. We keep following the clearly marked coast path along the edge of the cliff tops and we head downhill into Scratchy Bottom and then uphill to the top of Swyre Head. 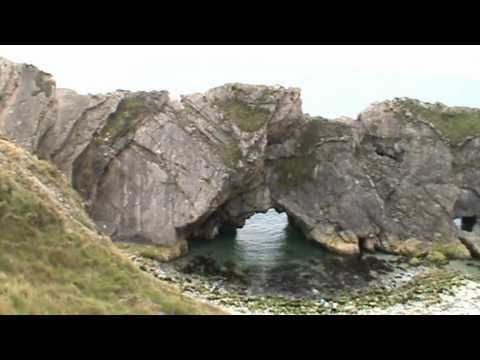 We go through a gate and continue along the coast path and drop down to Bat’s Head and Bat’s Hole, another natural limestone arch. We then go up and down the dips and then down into Middle Bottom and pass a stone marked Ringstead 2. We now head up West Bottom and pass a beacon on our right. We follow the path for a little further and turn right inland, leaving the South West Coast Path, through a gate at a stone marked Daggers Gate. We walk through the field keeping to the fence line on our left and when we reach a gate on our left and another stone marker we head straight forwards for Daggers Gate 1¾ on a grassy path through the field. We keep heading forwards through a gate and at the next gate we bear to the right following the sign post for Newlands Farm ½ and towards the caravan site. We then keep to the hedge on our left a field away from the caravan site and go through a gate onto a track that leads to a lane. On reaching a t-junction and Newlands Farm in front of us we turn right and then left. At the farm gateway we head forwards, to the caravan site entrance, slightly uphill for a short way to the road and then turn right and follow the road back to the church in West Lulworth. This is a moderate to hard walk with some steep inclines and declines on well marked cliff top tracks and grassy paths over fields. Dogs are allowed. Approx 7 miles allow 3 hours 15 minutes using OS map OL15, Purbeck & South Dorset. West Lulworth is in Dorset on the southern coast of England not far from Weymouth, Dorchester or Poole. From Dorchester take the A352 still towards Wareham. At Wool take a left turn onto the B3071 then the B7030 for West Lulworth. From Weymouth take the A353 towards Wareham turn right onto the A352 and follow as above. From Poole take the A35 towards Dorchester after Upton take a left turn onto the A351 to Wareham then a right turn onto the A352 towards Wool for a short way and take a left turn onto the B3070 to East Lulworth and West Lulworth. The car park is at the end of the road through West Lulworth and there is road side parking. There are public toilets with facilities for the disabled at the Heritage Centre at Lulworth Cove and at Durdle Door Caravan Park. For refreshments there are shops and a cafe at the Heritage Centre and a shop at the caravan park. In West Lulworth there are three pubs and a general store.